Jose Luis Macias was driving through Los Angeles last Friday in his Bentley Continental GT when someone fired multiple bullets into the car, killing him and shutting down Highway 101. The motive remains a mystery. So far, police have been able to learn little about the driver of the $100K+ Bentley or understand why someone would want to kill him. Photos of the car show nearly a dozen holes caused by a shooting at close range. 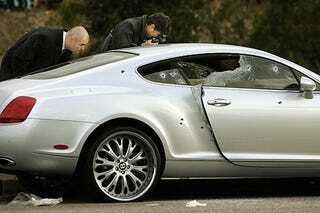 The Bentley crashed into the median after the barrage of bullets. He was pulled from the vehicle and taken to a local hospital where he died four days later.